The cruise line industry has been attacked by all forms of media, painting a picture of dread and mutiny on the high seas. Forecasters predict troubled waters due to the ever prevalent chatter of safety problems, mechanical breakdowns, disease outbreaks, and other major issues du jour. 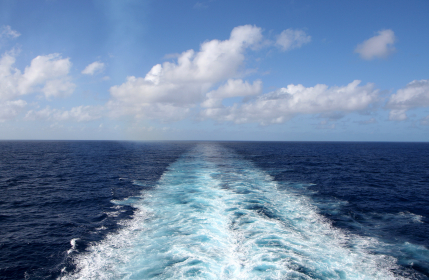 So What’s the Real Cruise Industry Forecast? I personally believe all of that hype is overblown to sell news. After a plane crash, does the airline industry quiver in waiting for the other shoe to drop? When news of a terrible car accident hits the airwaves, do the highways clear out with everyone walking to work? Because they found horse in British meatballs, do I turn vegan? As cynical as it sounds, we humans are a resilient bunch, and major issues becomes yesterday’s news as soon as the media force-feeds us something else to worry about. Honestly, I would be more worried about the consumerism of mass America taking over the allure of the seas. Every major cruise line is bringing land onto sea; the Cake Boss dude has branded shops on Epic, famous city parks are replicated on board floating cities, Dreamworks and Nickelodeon have become the Disneylands of Royal Caribbean and Norwegian Cruise Lines. Where does this end? Part of the magic of sailing is to disconnect. The seas are the last part of our world not conquered by mass consumerism. There is still a sense of wonder that evokes a simpler and more mystical time. There is still imagination and awe in finding the Valley of Diamonds or fighting off the giant roc. There is still a place for us to sleep with the balcony doors open and be serenaded by the gentle crashing waves sans iPod. Unfortunately, the current cruise industry forecast suggests more and more land-based brands taking over the seas. In 5-10 years, the ocean will look just like the land, and there will be no place for us to escape the marketing amusement park of our era. I get why the cruises have to sell their nautical souls to an overstimulated public as that is what the consumer expects. So perhaps this piece is more of a reflection of the zeitgeist with the cruise lines falling victim to its prey. That, I opine, is a much more dreadful decay of the cruise industry than a few negative PR stories blown out of proportion. Want more cruise industry news? Be sure to subscribe to our RSS feed and connect with Coyle Hospitality Group on Facebook and Twitter!